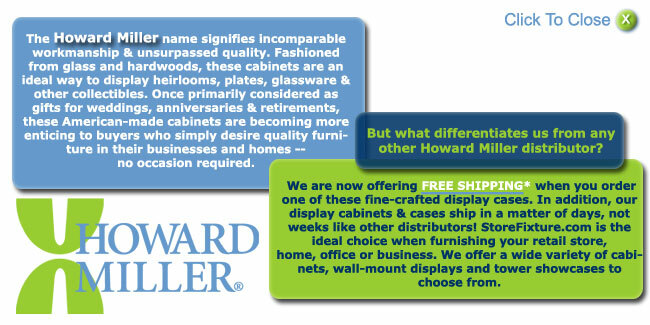 A No-Reach™ light located on the modern cabinet back provides easy access to lighting. Adjustable floor-levelers provide stability on uneven surfaces. 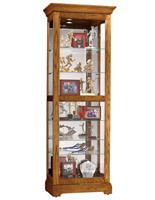 A side-to-side sliding, locking door provides easy access to, as well as security of, your collectibles. A glass, mirrored back enhances your valuable's appearance. 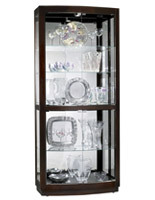 Fully adjustable glass shelving with Pad-Lock™ cushioned metal shelf clips for added stability. 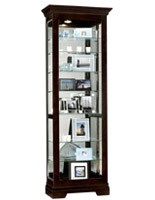 Interior lighting is a brighter way to showcase your items. 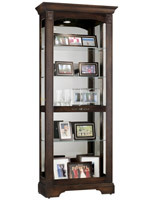 A versatile and modern Black Satin wood finish. 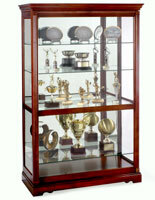 A curio case is an ideal modern curio cabinet for displaying family collectibles or souvenirs. 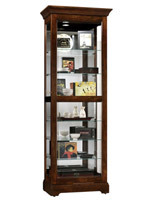 Four adjustable shelves allow versatility in size and height of items placed in the modern curio cabinet. Adjustable floor levelers are very important to help the modern cabinet stay well balanced on uneven surfaces or thick carpeting. 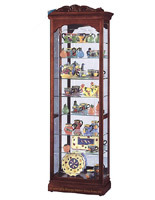 The modern curio cabinet stands 78" high, 32" wide. 25.3" x 78.0" x 17.5"